Craig Thompson and Sarah Heffron with their children at Mayfair Farm. Photo credit Kate Preftakes Photography. A project led by Cheshire County Conservation District, Monadnock Conservancy and Land For Good looked at the working relationships between landowners and farmers, particularly landowners with conservation easements in the Monadnock region. Here’s one story of a young farm family looking to expand their operation at Mayfair Farm, taken from this project, Farming on Conserved Land: Stories from Landowners and Farmers. The Howe family has a long-standing relationship with their land. 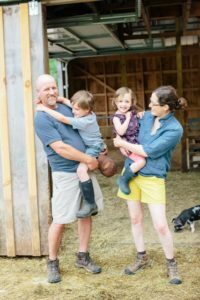 Sharman Howe’s grandparents bought Whippoorwill Farm over 100 years ago, and throughout that time nurtured this land to support sheep, maple syrup and, most recently, pigs. Sharman’s parents, David and Mary, protected the land with a conservation easement through the Monadnock Conservancy in 2007. When David and Mary recently moved into an assisted living facility, the time came to start thinking about a different way to run the farm. (Incidentally, their move coincided with the retirement of their long-time caretaker/farm manager.) Sharman and her husband, Ed Moura, had clear goals in mind for the property: sustainability of the farm operation, maintaining the good quality-of-life the farm provides and excellent stewardship of the land. They began the process of looking for a new farmer for the property by simply putting feelers out into the community. After a year-and-a-half search, they connected with nearby farmers Craig Thompson and Sarah Heffron of Mayfair Farm who were looking to expand their diversified operation. Sharman shared that it came down to two simple, but important factors — experience and proximity — both of which Craig and Sarah had. They spent the next year crafting a revolving 5-year lease agreement, which spells out use of the land, who is responsible for repairs/upkeep and payment terms. The parties annually review the terms and discuss any changes. In developing the lease, Sharman felt it helpful to consider a list of questions provided in the Land For Good guide, Landowner’s Guide to Leasing Land for Farming. Sharman also credits Ian McSweeney at the Russell Forest and Conservation Foundation, which provides technical assistance to landowners and farmers, for his guidance in developing the lease. Ultimately, according to Ed, this match works because “their needs meet ours and vice versa.” Craig and Sarah couldn’t agree more. They were looking for additional land closer to their home farm, after years of traveling long distances to hay small fields spread out across the region. Most of the properties did not have reliable access to water or fencing, or needed serious work to be viable farmland. So when the opportunity with Whippoorwill presented itself — in the form of an email out-of-the-blue from Sharman — Craig and Sarah were delighted. According to Craig and Sarah there are many benefits to leasing versus buying. For one, it allows a farmer to scale back their operation if need be — when their business model changes or the workload becomes too much. While they still continue to farm some land on just hand-shake agreements, Craig and Sarah agree that having a 5-year rolling lease on Whippoorwill was essential given the investment they were making in the land. Having a long-term lease is also required to qualify for certain grants and loans. He added that Whippoorwill Farm is the perfect example of this. It had been set up for lamb, hay and sugaring — and is this exactly what they are continuing to use it for today.